Unlike many station stops along the Northeast Corridor (NEC) that were established more than a century ago, the Baltimore Washington International Airport-Thurgood Marshall Airport station is a recent addition, opening for service on October 26, 1980. In fiscal year 2013, it ranked as the twelfth busiest station in the Amtrak national network. Among U.S. passenger rail stations, BWI Airport-Thurgood Marshall Airport holds the special distinction as the first facility built specifically to link rail and air systems, an important milestone in intermodal transportation planning. Local residents from as far south as Washington, D.C. and as far north as Perryville, Md. can reach the station via Maryland Area Regional Commuter (MARC) rail, while residents of the greater Northeast have access by Northeast Regional and Acela Express trains. The U.S. Department of Transportation (U.S. DOT) studied the idea of constructing a rail station on the airport grounds in 1969, but nothing immediately came of the concept, most likely due to the ongoing upheavals in the Northeast’s passenger rail network as symbolized by the bankruptcy of the Penn Central Railroad. Over the next decade, the federal government would step in to oversee the reorganization of the region’s freight and passenger rail systems, a process that gave birth to the National Railroad Passenger Corporation—better known as Amtrak—and Conrail, its freight-oriented equivalent. of the NEC in the 1930s. With these new companies in place, attention turned to upgrading and improving rail infrastructure, particularly the vital NEC between Washington and Boston. On the southern leg below New York City, the last major investments had taken place in the early 20th century when the Pennsylvania Railroad straightened the right-of-way, constructed soaring viaducts to separate the railroad from ground-level traffic, and later electrified the line. Beall noted in his letter, “The strategic location of BWI between Washington and Baltimore with the terminal only 1.5 miles from the main rail line makes this site ideal for a rail station.”2 Shuttle buses would move passengers between the airport and station. The senator believed a new station at the airport supported bicentennial planning efforts because it would allow air travelers to head directly for Washington Union Station, then undergoing a transformation to serve as the National Visitors’ Center. Additional support for the project was voiced by others in the Maryland Congressional delegation, including Senator Charles McC. Mathias, Jr. and Congresswoman Marjorie Holt. Washington International Airport and major highways. Amtrak did not immediately back the proposed station, as a new five to ten minute stop would impact train schedules up and down the NEC. Amtrak spokesman Jerry Friedheim wrote Senator Beall: “While we agree that [the idea] has merit, we do not believe that Amtrak is the agency that can most effectively operate such a connection.”3 The company, then only four years old, was mindful of its mandate to operate an intercity passenger rail system, and the BWI connection seemed a better candidate for commuter rail service. 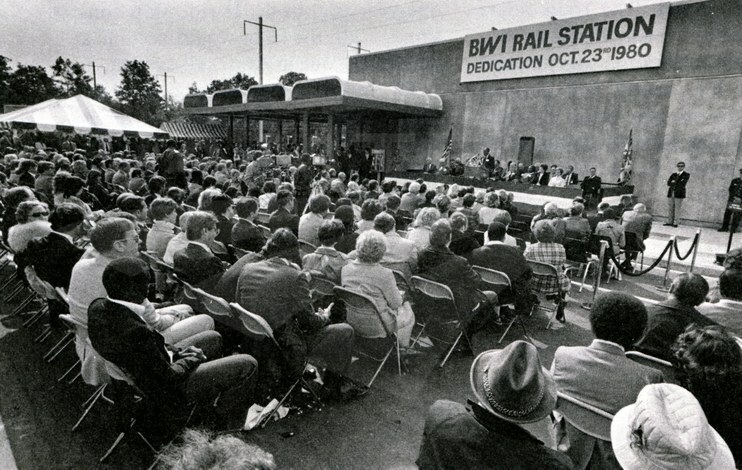 At the end of 1975, Congress approved $1.5 million for a “modest” facility as part of the 1976 appropriations spending bill, but this amount was later doubled.4 Although envisioned as a bicentennial project, the BWI Rail Station would not move forward until 1978. In the intervening years, Amtrak finally gained trackage of its own. Under the Railroad Revitalization and Regulatory Reform Act of 1976 (known as the 4R Act), Congress authorized funds for Amtrak to purchase the majority of the 457 mile NEC from Conrail. Used by intercity, commuter and freight carriers, an average 960 trains ran over the NEC each day, including 120 Amtrak trains. In addition to track, Amtrak obtained stations, maintenance shops and rail yards as well as other property. Building on the transfer of the corridor, the 4R Act also funded a five year, $1.75 billion program—known as the Northeast Corridor Improvement Project (NECIP)—for upgrading railroad infrastructure. Improvements to tracks, stations, electrical systems, signals and other components were expected to modernize the railroad for the next generation and reduce trip times, thereby strengthening intercity passenger rail as an alternative to driving or flying. Just as the NEC through Maryland was being rebuilt, work progressed at the airport to increase capacity. Dedicated by President Harry Truman in June 1950 and first known as Friendship International Airport, the facility was purchased by the state from the city of Baltimore in 1972. In 1979, as the rail station was under construction, the state concluded a $70 million project to double the size of the air passenger terminal. In the August 1978 edition of employee magazine Amtrak NEWS, an article stated that construction was to begin that fall on a “2,850-square-foot [station] building…designed for projected passenger usage in the 1980s, incorporating modern ticketing facilities, a passenger lounge and a vending area.”5 The station was built to modern accessibility standards as set out in the Amtrak Standard Stations Program guidelines. Under an agreement with the state, Amtrak oversaw construction of the depot, high-level platforms, overhead bridge and track. Maryland provided the land, adjoining parking lot and road access. Future maintenance and operations costs would be shared between the state and Amtrak. More than 400 people attended the station dedication, which included speeches and a reception. 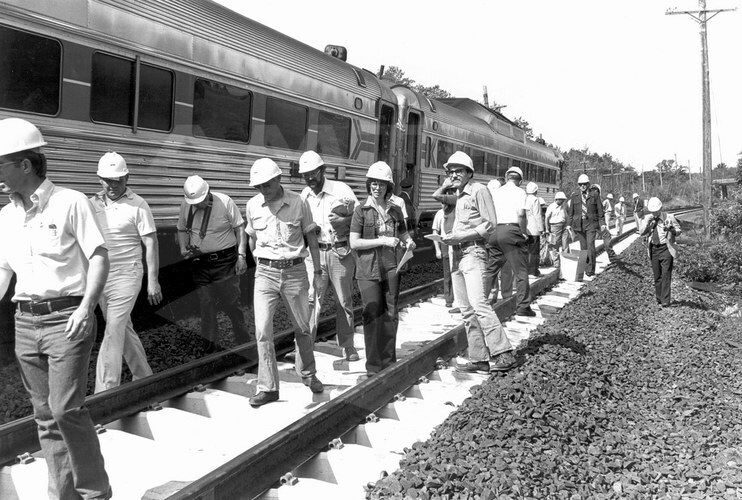 The official ribbon-cutting took place on Thursday, October 23, 1980—a “cool but sunshiny day”—before a crowd of approximately 400 persons representing the federal, state and local governments, Amtrak and the airlines. The Severna Park High School Band serenaded guests with musical selections, followed by the dedication at five minutes past noon. Among the speakers was Senator Mathias, who noted, “This is an excellent example of cooperation between the federal and state governments and local agencies in pursuit of an energy-efficient method for moving people.”6 Mathias’ statement was timely, as fiscal year 1979 had proved to be the best ridership year to date for Amtrak, due in part to the continuing energy crisis that encouraged Americans to look beyond their cars to fulfill transportation needs. Listening to Bill Norman, Amtrak Vice President of Marketing, the company’s stance towards the station had also changed. He told the crowd: “The linking of rail passenger service with this major international airport should significantly contribute toward increasing our train ridership not only in the Washington-Baltimore corridor, but throughout the Atlantic seaboard as well.”7 The sentiment echoed growing calls from the U.S. DOT urging for greater coordination between Amtrak, commuter rail, intercity bus and local transit systems. Sketch of the BWI Rail Station from an early brochure. Following the speeches and good wishes, the crowd enjoyed refreshments, including sandwiches and pastries, as well as celebratory champagne, provided by the airlines.8 Attendees could tour the modern cast-concrete depot and then board a bus to see the new airport terminal. An added treat was an invitation to visit the historic Baltimore Inner Harbor, which had become a model for waterfront redevelopment studied the world over. Regular passenger rail service began three days later. Train schedules were negotiated through a joint effort of Amtrak and Maryland’s State Aviation and State Railroad administrations. 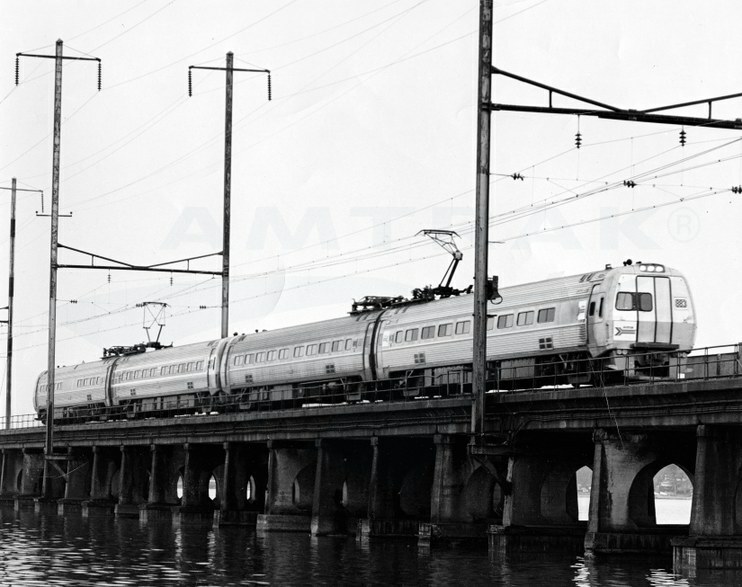 The initial timetable included ten Amtrak trains, such as the Colonial (Boston-Newport News) and Chesapeake (Washington-Philadelphia), but not the premium, high-speed Metroliner Service. Four Conrail commuter trains also stopped each weekday. 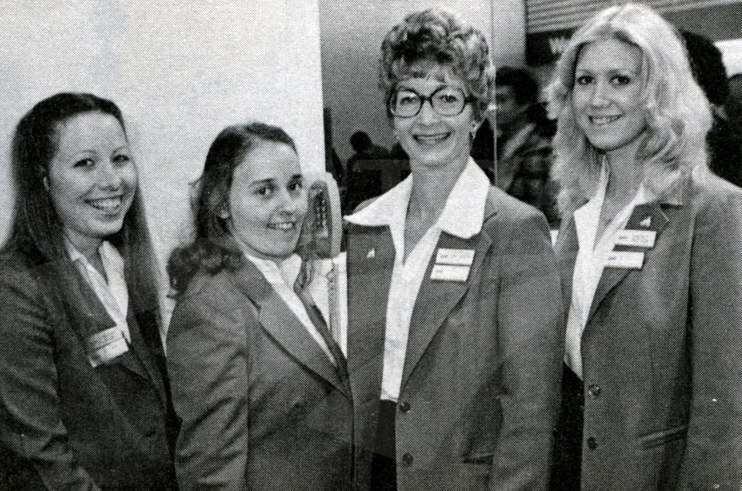 Ridership via Amtrak and MARC grew in the late 1980s when BWI Airport became an USAir/Piedmont Airlines hub, and again in the late 1990s as Southwest Airlines expanded its presence. In response, one morning northbound Metroliner Service train began stopping at the station in April 1987, and additional Metroliner Service and regional trains were added in subsequent years. The station also became a popular MARC stop used by residents in the western Baltimore suburbs, with connections available via local transit and state commuter bus lines. Station personnel pose for a photo following the dedication. Fast forwarding three decades, more than 710,000 Amtrak passengers used the BWI Airport-Thurgood Marshall Airport station last year, and it was served by an average 60 daily trains.9 The state of Maryland is currently laying the foundation for future upgrades. Under the American Recovery and Reinvestment Act of 2009, the state received $9.4 million in federal funds to provide engineering work and environmental studies to advance construction of a new depot, platforms and pedestrian-access improvements. The grant will also support efforts to construct a fourth track in the area to allow for the more efficient movement of Amtrak and MARC trains. Today, the BWI Airport-Thurgood Marshall Airport station no longer holds the distinction of America’s sole "air-rail-ground transportation complex," as it has been joined by four similar facilities. Since 1990, the Pacific Surfliner has served the Burbank-Airport Metrolink station adjacent to the Bob Hope Airport. Travelers can walk to the air terminals or hop on a shuttle bus. Newark Liberty International Airport station opened to the public in Fall 2001 to provide a link to Amtrak and New Jersey Transit. The AirTrain monorail connects the station and the airport terminals. South of Milwaukee, the modern brick and glass Milwaukee-General Mitchell International Airport station opened in early 2005. A free shuttle bus provides transportation to and from the air passenger terminal. That same year, the Oakland-Coliseum station opened on the Capitol Corridor route. Passengers can walk to the nearby BART station to catch the AirBART shuttle to Oakland International Airport. 1James D. Dilts, “Beall seeks BWI rail station to handle bicentennial crush,” The Baltimore Sun, May 8, 1975. 4“BWI rail station to be built with federal grant,” The Baltimore Sun, November 17, 1975. 5National Railroad Passenger Corporation, “Board Approves Corridor Air/Rail Facility, Beech Grove Program, St. Louis Station,” Amtrak NEWS, August 1978, 1. 6National Railroad Passenger Corporation, “Nation’s First Air-Rail-Ground Terminal Dedicated At Baltimore International Airport,” Amtrak NEWS, November 1980, 6-7. 9The rail station gained its current name after the airport was renamed in honor of Supreme Court Justice Thurgood Marshall, a Maryland native, in 2005.